…and far from the traditional hotel resorts often with their generic offer, the Herbal Glamping in Ljubno ob Savinji brings a freshness to both body and soul, as well as an unforgettable experience. As part of a new brand, Charming Slovenia is planning to open a number of such ‘glamping’ resorts that will be located in different parts of the country. 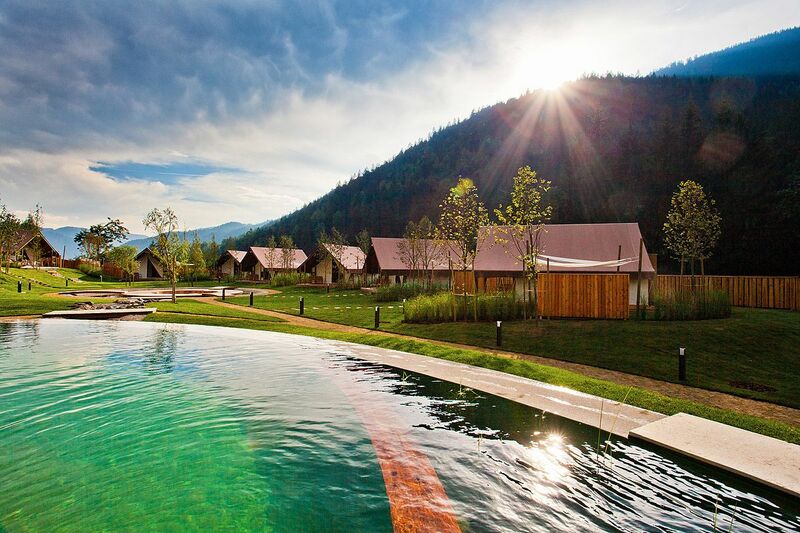 The first, located in Ljubno ob Savinji, opened in late August in 2015 and is designed as a boutique resort with a central theme of herbs and spices. The entire village is interwoven with sustainable stories, from its idyllic herb and vegetable gardens to the natural pool. The resort was designed by architect Gregor Vreš, who together with designer Borut Kokalj put all the finishing touches to it for today’s glamping aficionados. The duo is also known as the creators of glamping in Bled, which is very popular among meetings organisers. The glamorous tents offer luxurious spaces where only the raindrops, night hoots of the forest owls and the song of the morning birds reminds you that you are actually staying in a tent. Any ideas of ‘camping’ are transformed into ‘glamping’ immediately once you open the zipper and find yourself in something more like a tastefully furnished ‘hotel’ apartment with your own terrace, jacuzzi, spacious bathroom and direct contact with nature. Each of the ten tents that can accommodate up to four people offers double beds and a further charming bed on the first floor. The shower surrounded by wooden walls and a glass roof is a special treat of the room, letting you feel like you’re showering beneath the stars. The tents have been equipped with a great sense of fine detail and understanding of proper lighting, and the added possibility of heating means that the resort will be open all year round. The resort is suitable for small incentive groups of up to 40 participants who are willing to share tents. They will have the chance to experience a very unique energy in authentic contact with nature, one that helps restore the balance of body and mind. Attendees will relish gathering around the campfire as they would a central outdoor event space, as the space calls out for social teambuilding events or just socializing with a bit of the memory of the years of boyscouting. Should there be any rain, the restaurant in the main building can hold up 40 participants and is the perfect shelter. Alongside this, there is no shortage of places for meetings in a different format, from the terrace in front of the main facility to the inspirational amphitheatre around the natural pool. In the main building, what was once a barn is now a charmingly renovated restaurant, complemented by a small store offering selected local produce. The restaurant’s menu leans heavily on local, organic ingredients and the herbs and spices are freshly picked every day in their own garden. The wine list offers all of the Slovenian wine-growing regions in an intelligent selection. During a visit to the facility we were surprised by Jernej Nejc, the friendly head chef, who together with a solid team prepares dishes inspired by local tradition. The dishes are mainly based on the variety of medicinal herbs and the forest fruits of the mountain meadows and pastures, all of which you can taste in the rich breakfast with “solčavski sirnek” (cottage cheese from skimmed milk with cumin and salt, topped with sour cream and matured in a container with a slightly spicy taste), assorted breads and a wide selection of jams, meat and cheese. From the food selection it is almost compulsory to try “Zgornjesavinski želodec”, a dried sausage made from the highest quality pork and bacon. This premium product has rich tradition in the Upper Savinja Valley and is protected by a recognized geographical indication. The resort is connected to the herb and vegetable garden and at the workshop you will learn about herbs and their use in the production of cosmetics, teas, liqueurs and herbal spirits. The participants will try to catch a fish in the nearby river and then prepare it together with the Chef. Kayaking on a beautifully calm river can be done from May to October, with the entire programme lasting two hour. In the centre of Ljubno is a delightful museum where you can find an interesting collection that represents the life of “flosar”, or rafters, through a half millennia of history. Glamping is located in the heart of the Upper Savinja Valley and a good hour away from Ljubljana. Access by motorway from Ljubljana or Maribor by exiting Šentrupert towards Mozirje and then continue along the main road to Ljubno. Access to the village Ter, located 2 km away from Ljubno, is straight through the centre on the local road.